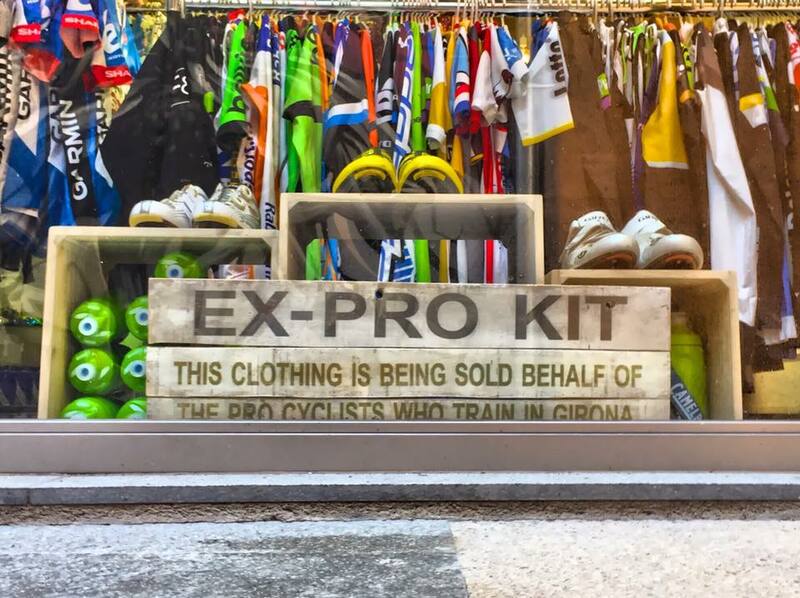 Girona - a cycling Utopia | theraceforthecafe.com . 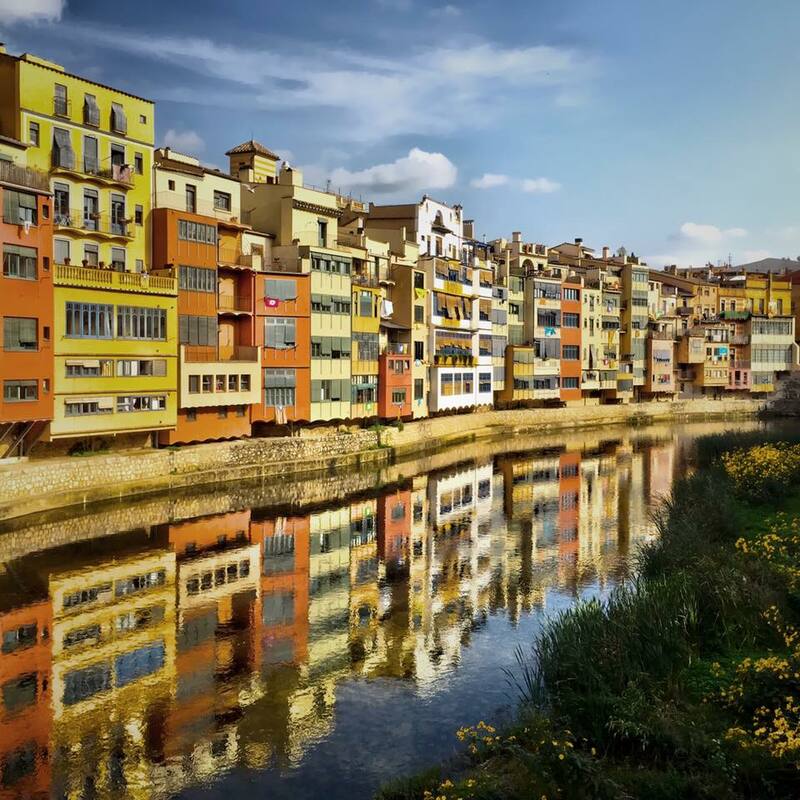 Last week Mrs Rees and I ticked a destination off our bucket list and spent three days in the Spanish city of Girona, somewhere I have wanted to visit for ages. 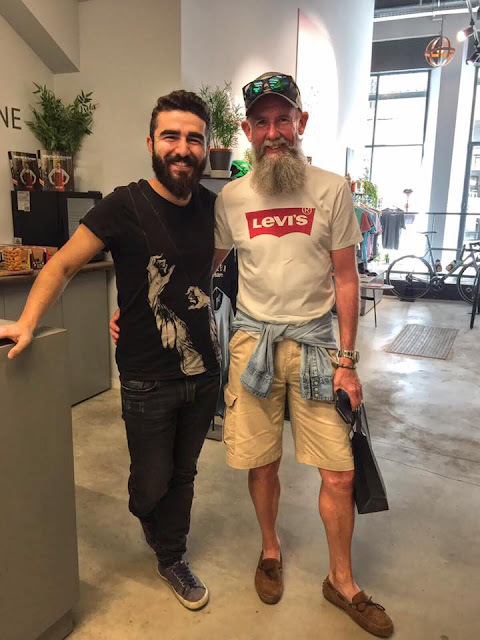 It was few years ago when I first read about the community of professional cyclists who have been basing themselves in Girona since the mid nineties, including for a while old whats his name? you know the American fella who won that big French race a few times. Girona has since become a seasonal home for up to fifty pro riders from around the world. The local residents have accepted the presence of cyclists (professional and amateur) to such an extent that cycling has become a signifcant element of Girona's culture. 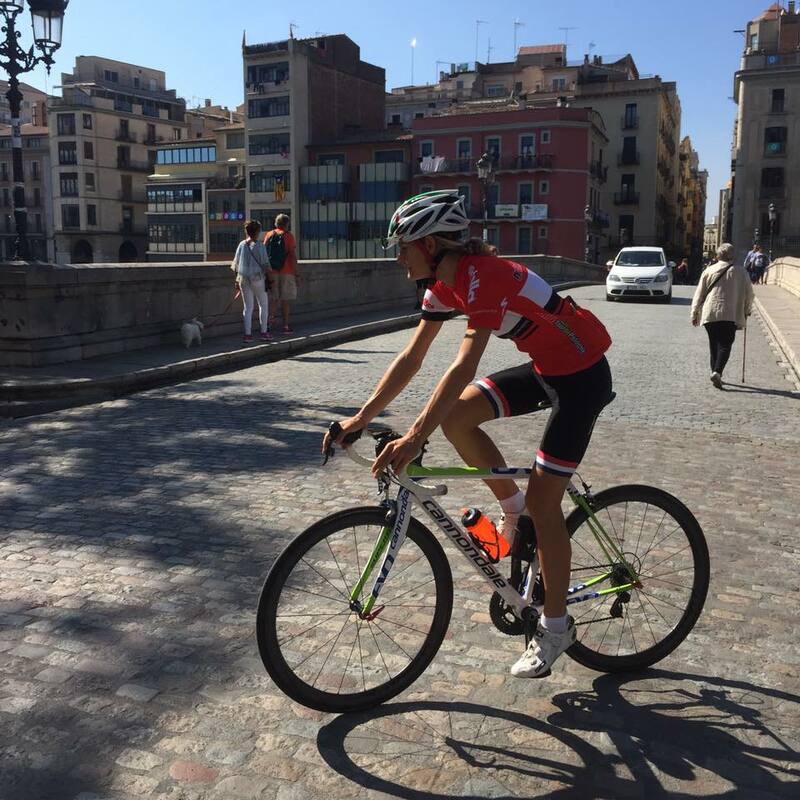 Above the Pont De Pedra bridge in the centre of Girona a popular meeting point for groups of cyclists. Girona is in the north east of Spain in the currently politically disputed region of Catalonia. The City (it's a small town really but it has a cathedral) is approximately 60 miles from Barcelona and about 25 miles from the resorts of the Costa Brava. The town itself is fairly flat but is surrounded by mountains, to the north west are the Pyrennes and it is a short ride out of town to get on to quite country roads. Girona is split by the River Onyar and the five foot bridges that connect the two parts of the town are a popular spot to get pictures of Girona's unusual architecture. Girona is small enough that you can walk everywhere without having to cover big distances, on one side of the river is the old town, the Barri Vell with the cathedral and historic Jewish quarter and on the other side is the slightly newer (17th/18th century) part which has a modern shopping area with some of the big retailers but also loads of small independent shops. Placa De La Independencia in the centre of the 'newer' part of Girona a great place for people watching. Restaurants and bars on all four sides of the square give it a great atmsophere on an evening. Some bargains on display in the shop window of Bike Breaks Girona They sell ex-pro kit both in the shop and online @ Pro Kit Corner it also looks like a great place to hire your bike from if you are ever in Girona. 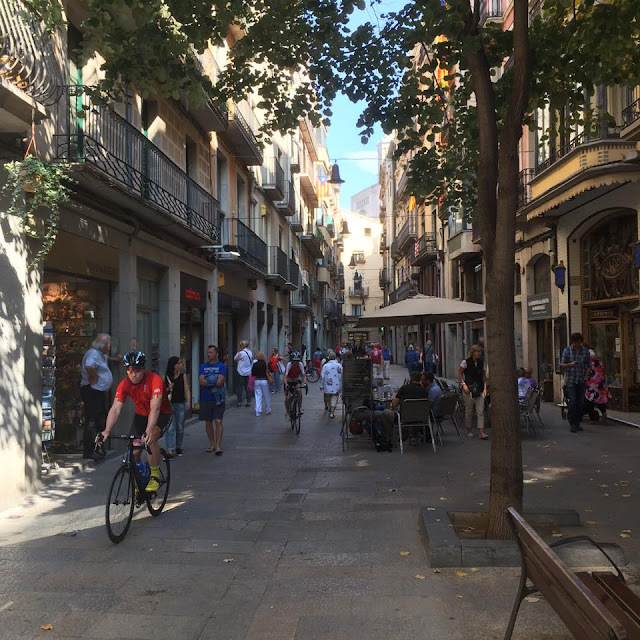 One of the main streets in the old town the Rambla De La Libertat with cyclists setting of for their days ride. We would see lots of riders cycling through the streets on a morning then we wouldn't see very many around town until they all began to return from training and hit the cafes and restaurants from about 3.00 pm. Above: Arguably the best cafe in Girona La Fabrica with Mrs R pictured tucking in to her breakfast muffin. 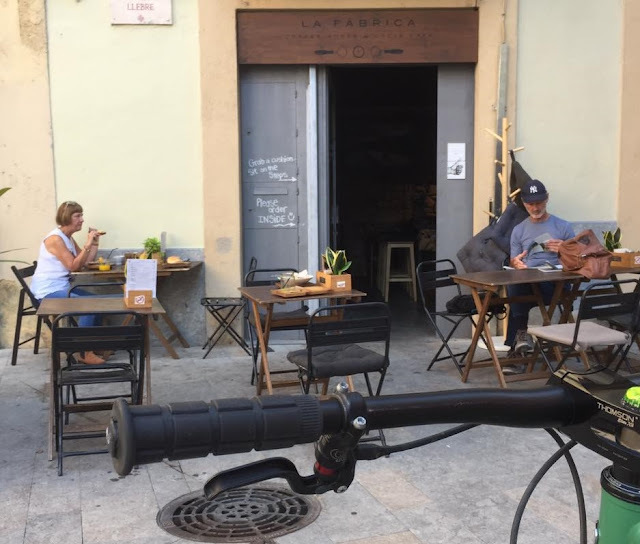 Owned by Christian and Amber Meier La Fabrica is not exactly a cycling cafe but it's certainly a cafe that caters for cyclists. Christian is a former pro (Garmin-Chipotle, UnitedHealthcare, Orica Greenedge) who based himself in Girona during his career. The couple opened La Fabrica (The Factory in Spanish) in 2015 in a building that was formerly an old carpentry factory, hence the name. 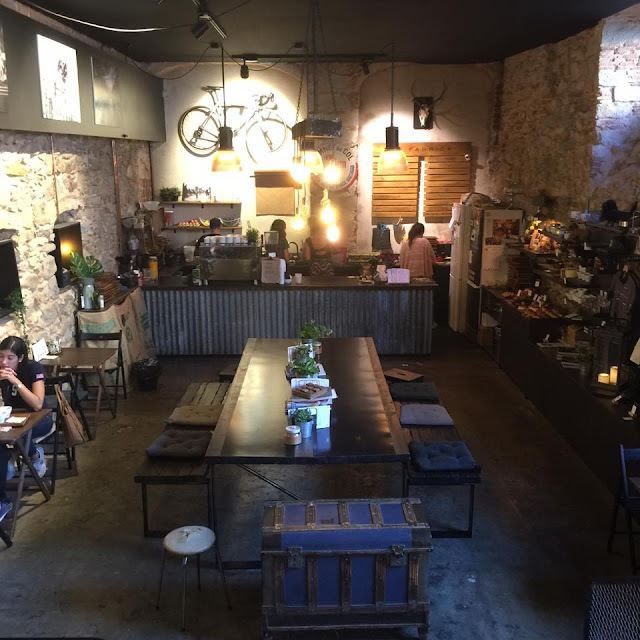 The cool interior of La Fabrica with a large communal table in the centre and cycling memorobillia and photographs adorning the exposed stone walls. 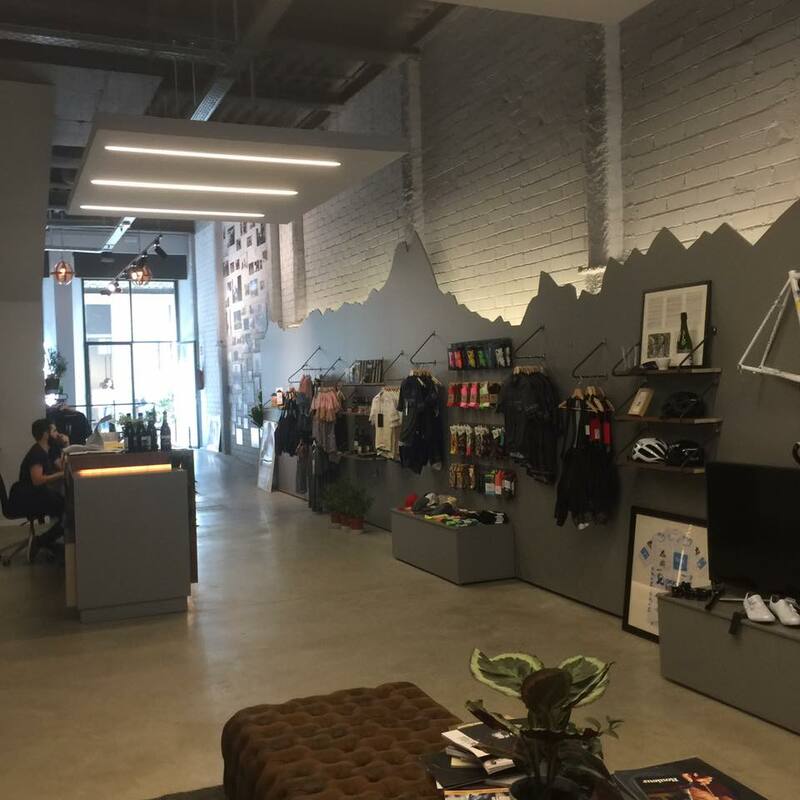 There are cycling books and magazines on the tables and a range of La Fabrica branded cycling and coffee related products on display. The interior of the cafe has loads of character and with the added bonus of outside seating. The coffee in La Fabrica is top quality as Christian Meier is something of a coffee expert and roasts his own coffee blends. 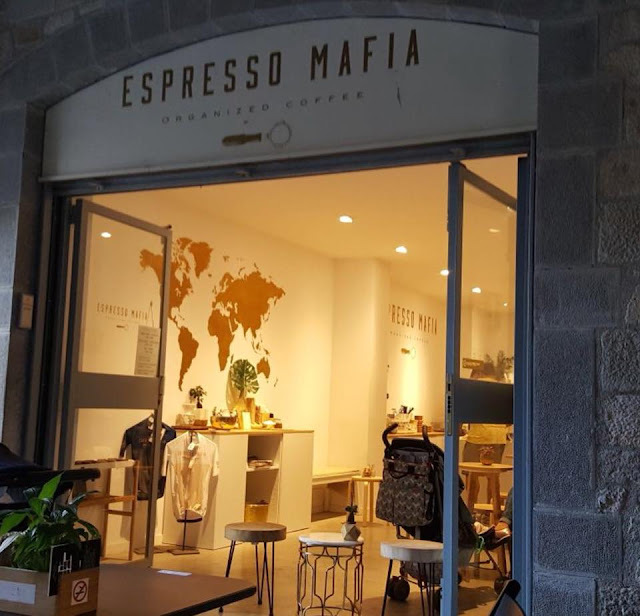 In addition to La Fabrica the Meier's recently opened a sophisticated espresso bar in Girona called Espresso Mafia with their own coffee roasting facility conveniently situated next door - very serious about coffee is Mr Meier. 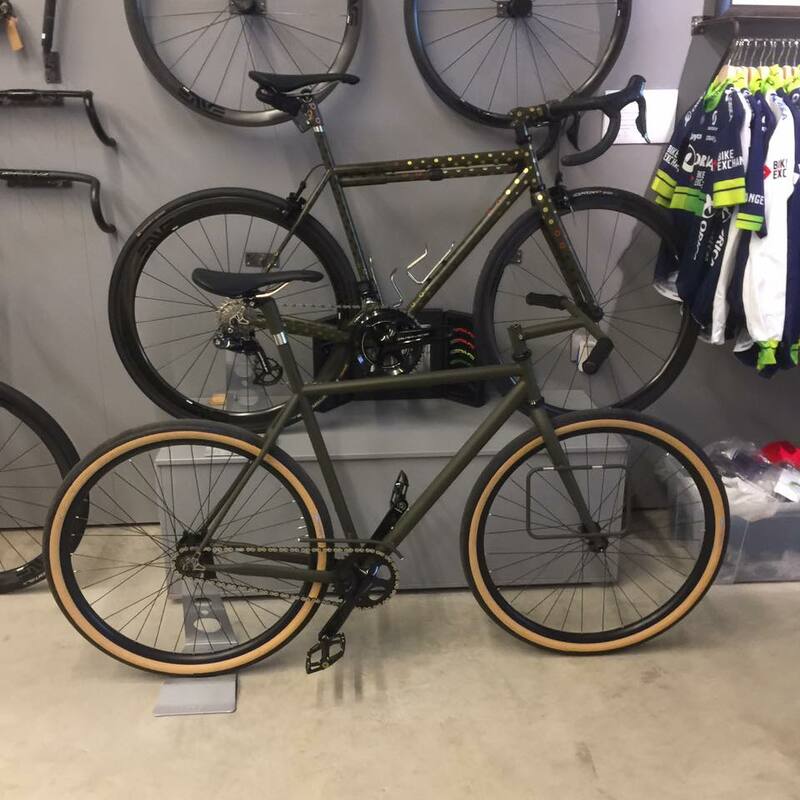 As well as creating the best cafe for cyclist in Girona Christian and Amber Meier are also the owners of what is without a doubt the coolest bike shop I have ever been in The Service Course . Although describing it as a bike shop doesn't really do the Service Course justice as on offer are a full range of cycling services: bike hire and maintenance, guided rides, airport pick ups, massage, lockers, showers and would you believe - a full laundry service for your kit ! The grey display board on the wall on the right of the picture above was commissioned especially for the shop and represents the elevation profile of one of the most popular rides in the Girona area. We were lucky to get a full guided tour and an insight in to the Service Course philosophy from the extremely friendly and helpful Kosar (above). He was keen to show us the fully equipped and beautifully designed workshop at the rear of the shop and close by the well appointed massage/treatment room. The attention to detail in the design of the shop and all of the products is incredible throughout, but one of the most impressive areas had to be the Paris Roubaix inspired changing and shower area - no expense spared in there. 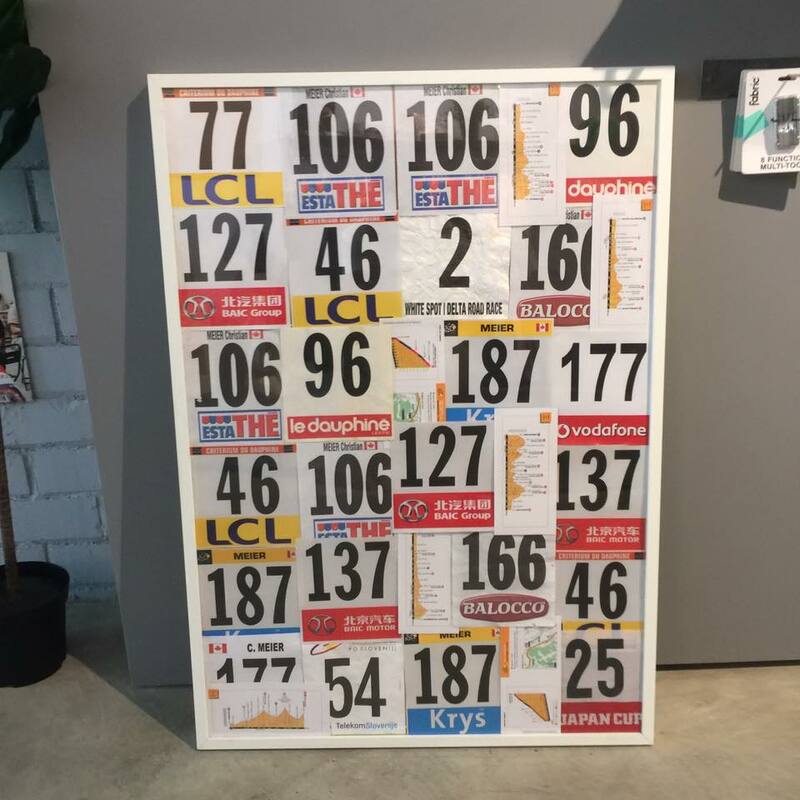 Some memorobillia from the career of Christian Meier on display in the Service Course. He won the Canadian road and time trial championships and rode all three Grand Tours as well as several classics and the world championships during a nine year professional career before retiring at the end of the 2016 season. 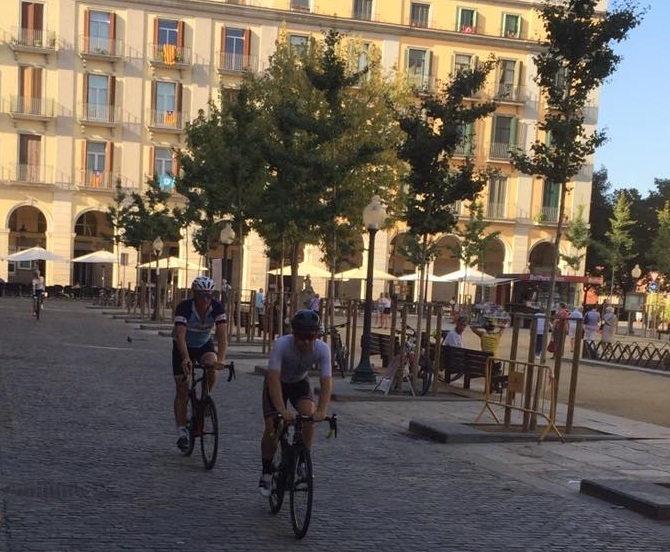 Girona isn't just a place for professional cyclist, the town caters for both leisure and commuter cycling too. 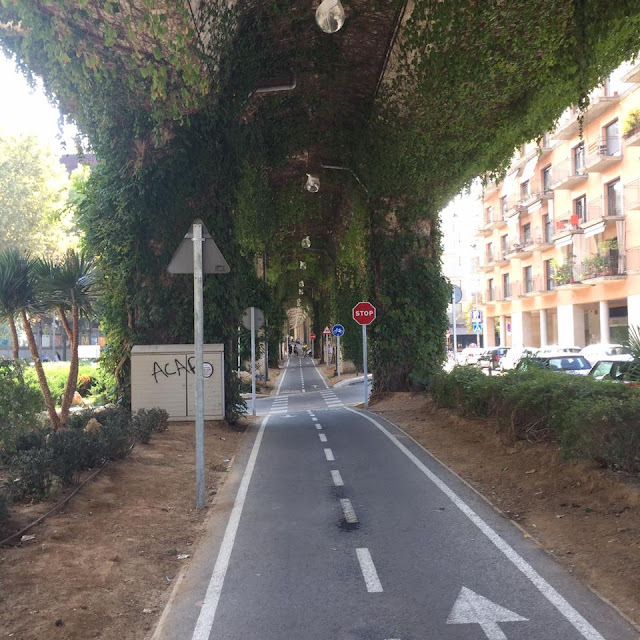 There is bike parking everywhere and an extensive network of well planned bike lanes and apparently there are also loads of off-road trails to explore nearby. 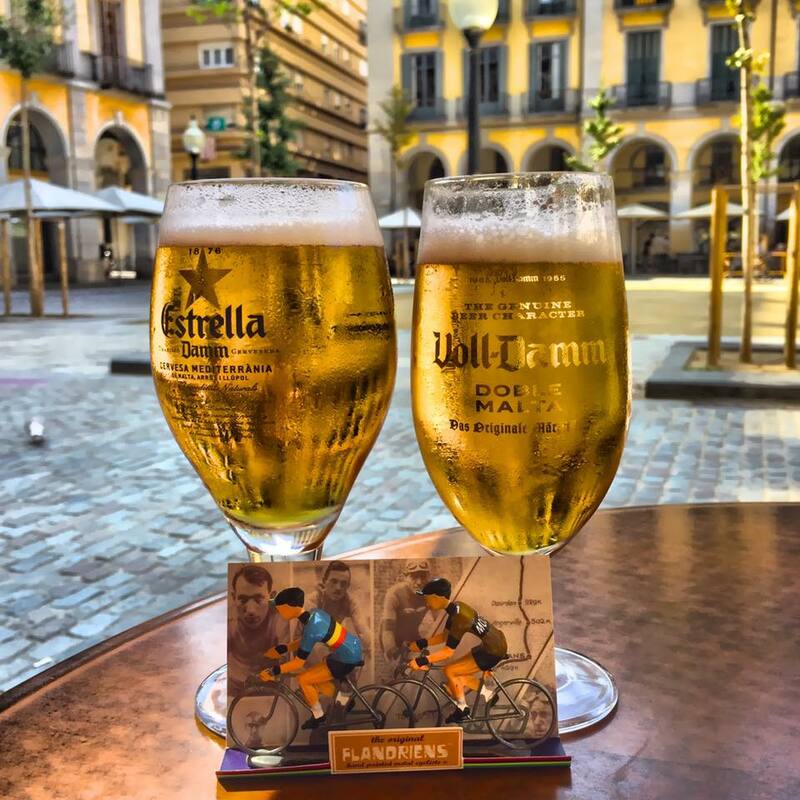 We are already planning a longer vist to Girona next year and looking forward to again relaxing in the Placa De La Independencia. Next time though it won't be just sightseeing and beer drinking there will also be three or four days of bike riding for sure.